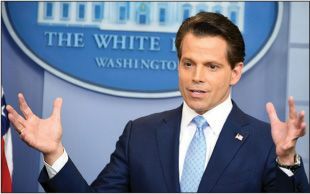 Enter Scaramucci, aka “The Mooch,” said Maureen Dowd, also in The New York Times, Trump’s “wealthy, mini-me Manhattan bro with wolfy smile and slick coif.” It’s easy to see why the president has turned to Scaramucci to fix his messaging. “A self-promoter extraordinaire and master salesman,” The Mooch ran his own hedge fund, SkyBridge, and exudes self-confidence. He spent the past six months adamantly defending the Trump administration on cable news. Scaramucci has no real communications experience, said Jennifer Kerns in Washington Examiner.com, but he’s “the right man for the job.” Educated at Harvard Law School, the financier is composed, articulate, and not easily flustered. As “the child of a construction worker” from working-class Long Island, N.Y., he also intuitively knows how to speak to Trump voters.